Design your template, add your content and manage your subscribers. 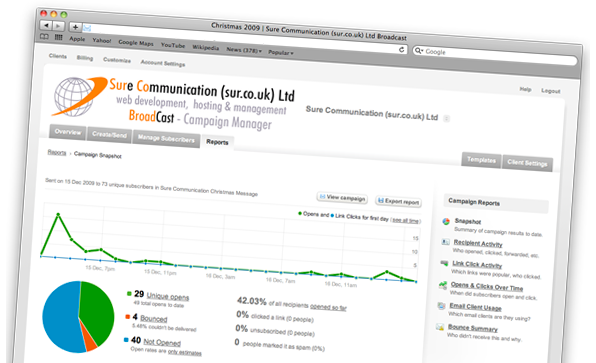 Send at your leisure or schedule for automated send, then track the success of your campaigns using Broadcast's built in reporting facilities! Easily create beautiful emails in minutes with our email builder. Choose from a range of designs with flexible layouts to create truly unique looking emails that will work everywhere. As BroadCast is completely web based you can access the system from anywhere via a secure login. The benefits here speak for themselves as you can manage your campaigns even from mobile devices on the move and has no setup or installation to do whatsoever. Pay as You Go is only £5.10 per campaign, plus 1.02p per valid recipient. There are NO limits on how many emails you are allowed to send. You can send as many email campaigns to as many recipients as you like whenever you want to. And don't forget; you can have as many email templates as you'd like for varying campaigns with alternate layout/design. Simply fill in your name and contact details below. We will then request payment of £99 for the setup of your secure system. © 2015 Sure Communication (sur.co.uk) Ltd.